Droopy is so sweet and wonderful! He is the sweetest boy, and has the cutest ears! Droopy and his sister Panda, who is also available for adoption, were taken to the shelter because their family was moving. LBWF was asked to save these 2 wonderful dogs, and now they are waiting for their forever loving home. 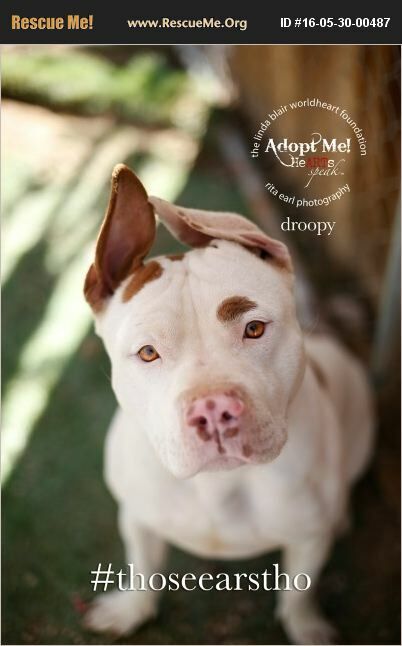 Droopy gets along with other dogs, and would make a great running, walking, or hiking companion! Droopy is up to date on vaccines, neutered & microchipped. If you are interested in adopting Droopy please fill out an application today and tell us about the great life you have planned for him! Applications can be found on our website www.LindaBlairWorldheart.org under the Adopt Today tab. Please visit our website to see all of our dogs available for adoption. Visit our Facebook page to see more pictures of our dogs Facebook.com/LindaBlairWorldheartFoundation Southern Ca adoptions only due to home checks.